We are located in Idaho’s Magic Valley. The natural history of Idaho’s Magic Valley is unique and profound. Back in the last ice age, the Bonneville flood was a catastrophic flooding event involving massive amounts of water that poured through southern Idaho and eastern Washington along the course of the Snake River. The flood is believed to be the second largest in known geologic history. This massive flood carved out the Snake River Canyon — a 600ft deep canyon rich with basalt and loess soil, leaving open channels of ultra-pure water flowing through on a constant basis (from Utah, all the way out to the Pacific Ocean). The pure water breaks through the walls of the canyon at an absolutely perfect temperature for raising salmon and trout: a constant 58°, year-round. It’s purified by volcanic rock, which makes it especially ideal for carefully controlling the growing fish’s environment. This geological history is unlike any other place on earth, and produces some of the world’s greatest fish. We operate five farm locations in Idaho for grow out, with over 120 clean concrete raceways. 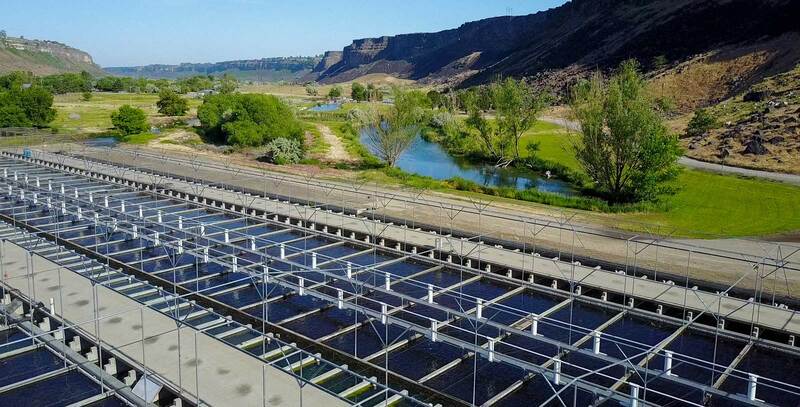 Our farms are supplied with 80 CFS of pure, 58° spring water from the Snake River aquifer. Our eggs are produced at our state-of-the-art sister farm, Riverence, in Washington State. Our farm teams are focused on perfecting the living environment for our fish, prioritizing animal well-being and production quality. We carefully manage pool densities, water quality, fish nutrition, and protection from predators to give our fish the high quality of life that produces healthier, better tasting end products. In pursuit of constant improvement, our network of sibling companies and partners around the world share valuable data (from egg production to grow out), allowing us to learn from one another and optimize our fish performance with minimized risk. Once the fish are ready for harvest, we carefully transport them live to our processing center. Here, they are processed by our team of operators, quality control experts and trimmers to become one of our fresh or smoked products.